Saudi Arabia insists the crash in oil prices is being fueled by oversupply, not a secret plot to hurt its archenemy Iran. "People should go back to Adam Smith and basic economics. 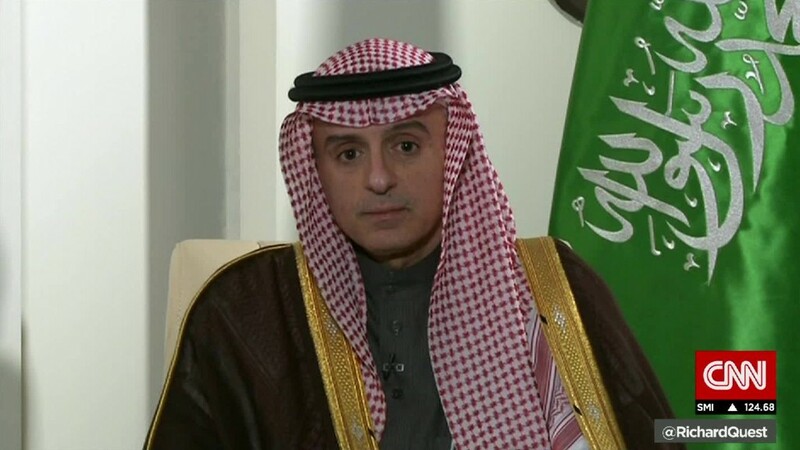 It's about supply and demand," Adel al-Jubeir, the Saudi foreign minister, told CNN's Wolf Blitzer on The Situation Room Tuesday when asked about allegations that the kingdom is trying to hurt Iran with cheap oil. Surging U.S. oil production has flooded the world with oil, and prices have plunged nearly 75% since mid-2014. Crude oil tumbled to a fresh 12-year low of $27.92 on Tuesday. Instead of electing to support oil prices by cutting output, Saudi Arabia continues to pump oil at an all-out pace. The Saudi strategy is designed to protect its turf, so that it won't lose more market share to high-cost producers in the U.S. and elsewhere. "We let the market determine where the equilibrium should be. What we're seeing now is the market price," al-Jubeir said. But beneath the Saudis' sudden embrace of free-market capitalism, some see a geopolitical motive: a desire to hurt Iran. The two kingpins of OPEC engaged in a scary staring contest earlier this month over Saudi Arabia's execution of a prominent Shiite cleric and the subsequent torching of the Saudi embassy in Iran. Now that sanctions have been lifted and Iran can return to the world oil market, there is some speculation that Saudi Arabia is trying to hurt it by tanking prices. Iran's economy is poised to rebound now that it's out of the financial penalty box. Iran plans to immediately ramp up oil production by 500,000 barrels per day, and aims to boost output by as much 1 million barrels within a year. "The Saudis are in no mood to do Iran any favors right now," Jason Bordoff, a former national security and energy adviser to President Obama, recently told CNNMoney. "They worry about a potential realignment of power in the Middle East if Iran were to emerge from the shadows of sanctions and reassert itself," said Bordoff, who is currently director of the Columbia Center on Global Energy Policy. But Saudi Arabia, which is grappling with its own financial stress due to cheap oil, insists it's not playing games with the energy markets. "You cannot manipulate the market and be able to do so consistently," al-Jubeir said. "If you try to manipulate it one way or the other, eventually you overshoot or undershoot and you pay a tremendous price for it." Al-Jubeir chalked up speculation about Saudi Arabia's motives to rumormongering. "In the Middle East, the conspiracy theories are about what the great powers are doing. In the West, the conspiracy theories are about what the oil powers are doing," he said.